These terms and conditions outline the rules and regulations for the use of Dhammika Magic Palace’s Website. By accessing this website we assume you accept these terms and conditions in full. 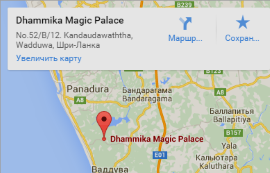 Do not continue to use Dhammika Magic Palace’s website if you do not accept all of the terms and conditions stated on this page. If you are among the organizations listed in paragraph 2 above and are interested in linking to our website, you must notify us by sending an e-mail to info@dhammikapalace.com. No use of Dhammika Magic Palace’s logo or other artwork will be allowed for linking absent a trademark license agreement. The Client may book the Services offered on the Site directly on the website or via the contact form or by e-mail info@dhammikapalace.com after having accepted these Terms and Conditions. To book the Service the Client needs to provide the requested information and then access a summary of all the Services selected, the total price of the Services selected and the specific conditions of cancellation of the Services, should they differ from those of the General Terms and Conditions, thus having the opportunity to verify the details of the Order. The Client must then ensure that all the information shown is accurate, as the Client will be solely responsible in the event of input error. After the payment has been processed according to the payment conditions specified for the Services selected, the Company sends the Client an email with the Order confirmation, including the important details of the order. All information contained in this confirmation email will be deemed to constitute an agreement between the Client and the Company. Each Client will receive one Order confirmation per booked service by e-mail to the address provided by the Client. Each Client must be able to present, upon request, a printed version of this confirmation, otherwise the Client will not be able to benefit from the booked Services. The Client must provide the Company with an e-mail address, enabling the Company to send the Order confirmation. As a precaution, if one day before the date of the reserved Service (provided an Order is placed more than one day before the service date) the Order confirmation has not been received for any reason, the Client should notify us of this fact via the contact form or by e-mail info@dhammikapalace.com. The Company offers its services to a worldwide clientele via the Internet. The conditions agreed to and commitments made remain valid regardless of the Client’s country of residence. As such, the Company cannot be held responsible in the event of a delay in the delivery of Order confirmation to the Client. The accuracy of information on all products and services offered by the Company is regularly verified. Illustrations and Services are provided for information purposes only and may be subject to change. Similarly, the details given may be subject to modification. They cannot in any case constitute a cause for compensation or a discount. The photographs illustrating the products do not form part of the contract. If these photos are found to be misleading or incomplete, the Company cannot be held responsible under any circumstances. The pictures, images, texts and descriptions are and remain the property of the Company and cannot under any circumstances be used by third parties. The Company is not committed to accepting any Order until after confirmation of its acceptance via an e-mail sent to the Client. The Company reserves the right not to proceed with certain Orders. In this case and as far as possible, the Company will inform the holder of this Order by e-mail. In order to best serve its Clients, The Company endeavours to respond to requests within two working days from the Order confirmation and always before the date of the requested Service. However, this period is not contractual and cannot constitute grounds for complaint. If the Client does not receive the Order confirmation before the date of the Service, the Client may contact the the Company via the contact form or by e-mail info@dhammikapalace.com. Traffic and traffic jams in Sri Lanka can cause delays and changes in time-schedule. In no event shall the Company be held responsible for expenses incurred as a result of the delay of a flight or transfer and no compensation may be requested from the Company in such cases. The descriptions of the Services presented on the Site specify, for each Service, what is included into the Service price and any special conditions. The prices shown are those in effect at the time of booking. Unless expressly stated otherwise, all costs that are not expressly included into the Service Description, whether personal or incidental to the Service (such as, but not only: insurance, delivery costs for any documents, laundry charges, telephone bills, alcohol drinks, tips that may be given to accompanying tour guides, drivers or local guides, anything of a personal nature) are not included into the Service price. When the order includes an accommodation Service, prices are calculated according to the number of nights, not the number of whole days. The prices displayed on the site are for information purposes only. They do not represent any contractual commitment from the Company and may differ from the amount found by the Client on other sites. The prices shown on the Site are valid at the time of their posting and are, in principle, valid for the current season. If the Client’s request is outside the price validity date, an adjustment may be necessary. The decision of the Company regarding this matter is final and non-negotiable. The Company reserves the right to modify its prices without prior notice, particularly in the event of changes in exchange rates, service rates or taxation. Client’s payment using a credit card and especially via the Internet does not imply a “physical” invoicing operation by the Company. The Company accepts the following payment methods: Mastercard credit cards, Visa credit cards, PayPal, WebMoney and direct bank transfers. The processing of credit card payments does not include any fees or commission. Full payment by credit card is required to make a reservation. Any payment by bank transfer must be made for the amount due, net of any commission or bank charges. The Client must therefore ensure that the Client’s bank will take charge of these expenses at the time the transfer is carried out. No refund is possible for any service, tourist package, accommodation, meals or any other service which has already been used. The Company reserves the right to ask its Clients for any document (identity document, passport, driving license) in order to verify their identity in the event of suspicion of fraud. Inputting credit card details into the system constitutes an obligation to pay. Payment can only be reversed in the event of loss, theft or fraudulent use of the card. Apart from these cases, which are strictly admitted by the legislator, the cardholder is responsible for fraudulent use of the bank card. In particular, the right to object to payment cannot be used to compensate for the absence of a right of withdrawal. The Company has chosen an established and quality provider Paysera to manage its card transactions. The confidentiality of the information is ensured by the service provider chosen by the Company, it is solely responsible for the payment transactions and the confidentiality of the information provided by the Client. An SSL (Secure Socket Layer) protocol is used to encrypt information, meaning that the Client has the best quality of service for the online payment. The Company shall not be held responsible in the event of a data transmission failure and in particular in the event of loss of data confidentiality. The Services ordered on the Site are subject exclusively to the conditions of cancellation and modification provided for in these General Terms and Conditions of Sale and the Client cannot invoke the right of withdrawal. The Company reserves the right to cancel, modify or replace any service that the Client has booked on the Site at any time and for any reason whatsoever with a written notice sent to the contact e-mail of the Client at least 7 days in advance. In case of modification or replace of the service, if the proposed new choice is not suitable for the Client, the Client will be entitled to a full refund of the initial purchase price. The Company strives to best serve its Clients. However, some of the Services offered by the Company are subject to the availability of its Partners / Service Providers. No claim or indemnity may be filed by a Client if the booked Service is not available. If the Services selected by the Client are not available, the Company will endeavour to provide an alternative which is similar to the request made. The Company will use all reasonable means to notify its Clients in order to modify the reservation whenever possible. The Company endeavours to do everything possible to ensure the smooth running of the Services sold to its Clients, without, however, being held responsible for any unforeseeable circumstances, causes of force majeure or situations created by third parties (particularly in the event of a strike). However, even in these latter cases, the Company will endeavour to find solutions to overcome any difficulties. Accept the proposed change. In this case, an amended Order confirmation will be sent to the Client and an e-mail will be sent, specifying the modifications and the increase/decrease in the price. The Client shall not be entitled to any compensation if the cancellation of the Service is imposed by circumstances relating to the safety of the Client. In addition, the Company cannot held responsible for its Service Providers, who retain in respect of any Client their own general conditions as well as the responsibilities specific to their business activity under the statutes governing them, their national legislation or international conventions instituting among other things, a limitation of liability. The Company cannot be held responsible for the failures of its Service Providers, who may cancel or modify a service for technical reasons. Clients release the Company of any responsibility in the case of a violation of the Sri Lankan legislation committed by them. The conditions of cancellation below apply to all the Services provided on the Site except for the conditions specifically mentioned in the Service Description of certain Services. Up to 8 days before the start date of the Service, no cancellation fees will be charged to the Client. From 4 to 7 days before the start date of the Service, 50% of the amount of the Service will be charged to the Client. From 0 to 3 days before the start date of the Service, 100% of the amount of the Service will be charged to the Client. Up to 5 days before the arrival date, no cancellation fees will be charged to the Client. From 0 to 4 days before the arrival date the Client will be charged the first night. Up to 10 days before the arrival date, no cancellation fees will be charged to the Client. From 0 to 9 days before the arrival date the Client will be charged 10% of the amount of the Service. 4) In the event of a no-show, 100% of the amount of the Service will be charged to the Client. No insurance is included in the prices of the Services offered on the Site. The Company recommends that you take out an insurance policy covering the consequences of various types of cancellations at the time of your order. It is your responsibility to decide whether you take the risk or take out an insurance policy. The Company recommends to read the insurance contract carefully (including the exclusions, limitations or conditions for the validity of the insurance) before taking out the insurance. An acknowledgment of receipt of this e-mail confirming that it has been received and processed by the department concerned, will be sent to the Client within a maximum of 3 days. It is up to the Clint to enquire, before placing any orders, about any local events such as religious festivals, national holidays, public holidays, etc. which could affect the smooth running of the trip, it being specified that no complaint regarding this matter can later be addressed to the Company. Under these conditions, by accepting these General Terms and Conditions of Service, the Client declares that the Client is familiar with the characteristics and limitations of the Internet, in particular with regard to the technical performance of the applications developed therein and with regard to the security of communications and data. The Company undertakes to use the data collected from its Clients only within the legal framework. Any Client may delete his or her data from the contact list by contacting us via the contact form.